Forecasts of real GDP growth attract a lot of media attention. But what matters more to the person on the street is how growth translates into jobs. Unfortunately, the mediocre growth outlook of recent years may lead to a disturbing outlook for jobs, particularly among fuel-exporting countries and in the Latin America and Caribbean region. Chart 1 provides a measure of the global unemployment rate based on data for 116 countries, of which 37 countries are classified as “advanced” (a term used in the IMF’s World Economic Outlook to refer to high-income countries) and the remaining 79 are emerging and developing economies (for brevity, we refer to the group as “emerging economies”). The unemployment rate in advanced economies has declined over the past couple of years—with sharp declines in the United States and slower progress in the euro area—and this trend is expected to continue. 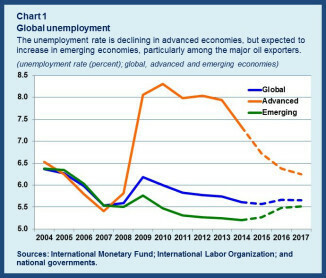 In contrast, the unemployment rate in emerging economies is expected to increase over the course of this year. Much of this increase is expected to occur in countries where fuel exports are a big share of export earnings. As shown in Chart 2, the unemployment rate in this group is expected to increase to 8.4 percent this year, a full percentage point above the estimate for last year. Looking across regions, Latin America and the Caribbean in particular, face a sharp increase in the unemployment rate (Chart 3). In 2016, unemployment in the region is expected to be nearly 8 percent, over two percentage points higher than it was two years ago. This sharp rise is driven by recessions in large economies in the region, such as Brazil. Elsewhere, many economies are growing modestly, thus limiting the labor market deterioration (see the IMF’s Regional Economic Outlook for the Western Hemisphere). These increases in the unemployment rate imply job losses for thousands of people across the region. The declines in employment for the cases of Venezuela, Brazil and Argentina are shown in Chart 4. In Brazil, the job loss between 2014 and 2016 is expected at over 2 million people. As the Inter-American Development Bank’s (IDB) 2016 report on the region notes, this cloudy outlook for labor markets comes after a decade of progress during which more than 50 million people in the region escaped poverty, inequality fell, and the share of informal workers declined significantly. As of last year, labor markets seemed to remain buoyant, despite the slowdown in growth in the region. However, as an IMF blog cautioned at the time, “labor markets are not as strong as they appear” and there was evidence of “weakening beneath the surface”. With the growth outlook marked down further since then, the outlook for the labor market has become much more disturbing. Both the IDB and IMF note that the extent to which growth and jobs are linked varies considerably across countries in the region. Chart 5 shows the so-called Okun coefficient for countries in the region: this is the estimated historical relationship between unemployment and GDP growth. For the three countries with the biggest increases in unemployment rates—Argentina, Brazil and Venezuela—the link is reasonably strong by the standards of emerging economies. In Brazil and Venezuela, a one percentage point increase in growth lowers the unemployment rate by 0.2 percentage points; in Argentina the impact is about half as strong. Restoring the health of labor markets in the Latin America and Caribbean region will thus require a return to stronger growth as well as more targeted measures to tackle barriers in the creation of private sector jobs, which may vary from country to country. In particular, it would be useful to provide assistance for job seekers through a mix of placement services, retraining and—in some instances—subsidies to encourage formal sector employment. In the short-run, the presence of large informal sectors may buffer the increase in formal sector unemployment rates. But the transition to the informal sector is likely to be associated with wage losses in the short-run, and a loss of skills and ability to move to the formal sector if it persists. Hence, a more lasting solution is needed to the emerging unemployment problem in the region.